Working with customer, I faced pretty nasty bug, which is actually not rare situation , but in this particular there are some lessons I would like to share. Trash state means that InnoDB won’t start, and you need to use innodb_force_recovery=3 and mysqldump your data. What makes problem even worse is that InnoDB does not report tablename, so you are pretty much blind and need to dump whole dataset, which can be long process. as DRBD mirroring physical data, and MySQL keeping crashing on both instances – active and passive. “You do not have access to bug #55543.”, because it is marked as “Security problem”. And I actually tend to agree that bug can be considered as “security”. Now another interesting point – how can you be sure that 5.1.51 works. – Review your HA schema. DRBD by itself (without additional solutions) can’t guaranty decent level of High Availability. And just to be clear, it is not DRBD problem, DRBD basically can’t help if there is possibility that application corrupts data by itself. For this case regular Master-Slave setup (in addition to DRBD) would protect from such problem. Erin and Mike, organizers of SF Meetup generously invited me to talk on coming SF Meetup on Dec-14 about new features in InnoDB in MySQL 5.1 and 5.5 and, what is pay attention to, when you upgrade from MySQL 5.0. Although I personally mostly in 5.1->5.5 upgrade area, Erin insured me that upgrade from MySQL 5.0 is still actually question for many users, so I accepted invitation. Event details are on Meetup.com page. So if you are up for free pizza, soda and do not mind to listen to me, welcome to join! December, 8th 9AM PST: Introduction to Percona Server, XtraDB and Xtrabackup. As the title suggests: this presentation is an introduction. We will be running through the main aspects that change, and where you can expect to get the most benefit. This will be a technical talk, but perhaps less technical than some of our other posts. I recommend inviting a few friends & colleagues that are already familiar with MySQL, but perhaps not regular readers of our blog. (Time for Q&A will follow the main presentation). Percona Server version 5.1.52-rel11.6 is now available for download. Percona Server 5.1.52-rel11.6 is now based on MySQL 5.1.52. Release Notes for this and previous releases can be found in our Wiki. The latest downloads are available on our website. The latest source code for Percona Server, including the development branch, can be found on Launchpad. For general questions, use our Percona Discussions Group, and for development questions our Percona Development Group. Webinar will cover the process in a lot more details though I would like to go over basics in advance. You can also check my old post on this topic about Moving MyISAM to Innodb as well as searching the blog – We’ve blogged so much on this topic. So what are the basics ? Regression Benchmarks – Make sure to run regression benchmarks in particular in terms of concurrent behavior. You may have hidden dependencies of MyISAM table lock behavior in your applications, also check if your application handled deadlocks well. MyISAM will not produce deadlocks for Innodb you should always see deadlocks as a probability as long as you write to the database. They may be rate but it is rather hard to guaranty you will never run into them. Feature Differences – There are some feature differences between MyISAM and Innodb though well it is typically easily spotted by converting tables to Innodb on restored backup. Full text search indexes, GIS, multi-column auto increment keys are great examples. There are also different limits for MyISAM and Innodb – it is possible to have some rows which can be stored in MyISAM but would not fit to Innodb, though this is an exception. Space Innodb Tables tend to be larger. Again converting schema will show you some of this. Though the best is to take a look at the size after stressing system with load for a while as depending on the schema and usage Innodb tables may increase in size significantly due to fragmentation. Usage Differences What works well for MyISAM may not work for Innodb and vice versa. You may benefit from different index structure for Innodb, including different primary key setup, as well as you may want to structure workload differently. With MyISAM it is often for people to do updates in small chunks, almost row by row to avoid holding table lock for long time in Innodb you want larger updates to reduce cost of transaction commit. You also may want to avoid excessive SELECT COUNT(*) FROM TBL (with no where clause) which is very fast for MyISAM but does table/index scan for Innodb. Defaults You need to know two things about defaults for Innodb. First Depending on MySQL version they may be somewhere from suboptimal to absolutely disastrous, you do not want to try to run Innodb or XtraDB with them. Second Innodb is tuned to be ACID by default – if you’re moving from MyISAM often you do not need such strong guarantees and can at least change innodb_flush_log_at_trx_commit=2. It still will be much more secure than storing data in MyISAM. The 3 most important values to check are innodb_flush_log_at_trx_commit, innodb_buffer_pool_size and innodb_log_file_size. There are a lot more options for fine tuning but make sure at least these are right. Percona XtraBackup 1.4 is now available for download. Version 1.4 fixes problems related to incremental backups. If you do incremental backups, it’s strongly recommended that you upgrade to this release. Miscellaneous important fixes related to incremental backups. Release Notes for this and previous releases of Percona Xtrabackup can be found in our Wiki. The latest downloads are available on our website. The latest source code can be found on Launchpad. Please report any bugs found at Bugs in Percona XtraBackup. Cars are so last century … but, so is Linux, right? This past weekend, I attended the 2010 Los Angeles Auto Show. I’m not a huge car buff. I do think that BMW’s are the bomb, and I like Honda’s common sense vehicles, but really, I am NOT a car guy. However, I thought this was an interesting chance to take a look at an industry that, in my opinion, isn’t all that different than the one I’m in. Now, that may surprise some. Its pretty easy to think that I work for a super advanced company that has started a revolution and sits on the bleeding edge of innovation. I mean, at Canonical, we’re doing all kinds of amazing stuff with “the cloud” and building software that makes peoples’ jaw drop when they see it in action sometimes. But really, I think we’re more like CODA. CODA has built what looks to be a sustainable, practical electric car. The car itself is not visually stunning, but the idea behind it is. Make an electric car that anyone can buy *and* use. Make it fun, and make sure the business is sustainable. But, in no way is CODA challenging the ideas and revisions that have worked for the 100+ years that the car industry has existed. CODA is still putting a steering wheel, gas pedals, and gear shift in the cockpit for the driver. There are doors, wipers, lights, and probably floor mats. In much the same way, in Ubuntu, we’re still putting our software out there with the intention that, while its created differently, and affords the user more capabilities, it is basically driven in much the same way as Windows 7 or OS X, mostly as a web, errrr, cloud terminal. The exciting part is that for $3 of possibly more efficiently produced electricity, you can drive 100 miles. Even more exciting is that the CODA might actually compete with sensibly priced (but larger) Honda and Toyota sedans, rather than like the Tesla cars that compete with Lexus and BMW’s. Given this way of thinking, the auto show was extremely interesting. The electric car (open source?) has “arrived”, and the established players are buying the interesting enabling technology like batteries (android’s linux kernel, darwin for mac, etc) from companies like Tesla, and putting them in their established products. Whether consumers care about either open source or electric cars is another story.. maybe the 2011 LA Auto Show will have an answer for me on at least one of them. Is there benefit from having more memory ? 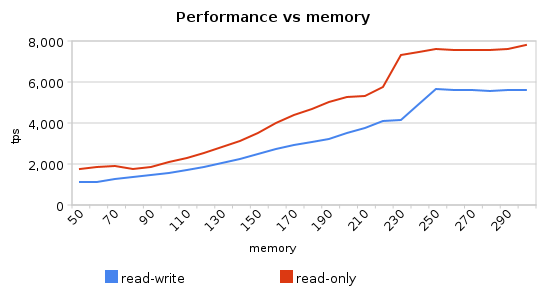 My post back in April, http://www.mysqlperformanceblog.com/2010/04/08/fast-ssd-or-more-memory/, caused quite interest, especially on topic SSD vs Memory. That time I used fairy small dataset, so it caused more questions, like, should we have more then 128GB of memory? If we use fast solid state drive, should we still be looking to increase memory, or that configuration provides best possible performance. This allows as to see effect of having more memory available. So you see doubling memory gives 3x ! performance improvement. And it is despite we store data on one of fastest available storage. So to get best possible performance our advise is still the same – you should try to fit your active dataset into memory, and it is possible as nowadays systems with 300GB+ RAM already available. Ewen and I have just published Percona’s latest white paper, Forecasting MySQL Scalability with the Universal Scalability Law. This is essentially a streamlined walk-through of Dr. Neil J. Gunther’s book Guerrilla Capacity Planning, with examples to show how you can apply it to MySQL servers. I’ll probably follow this up with another blog post or white paper at some point in the future, to show how to use the busy time and query response time to predict a system’s scalability.